New Members work to complete the membership commitments to be admitted to Active membership. They are not eligible to vote or to hold office. During their New Member year, every member is required to complete a training course based on the Association of Junior Leagues International (AJLI) guidelines. 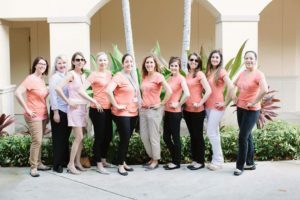 Before the training course begins, each New Member is given an orientation of the responsibilities and privileges of membership and must agree to engage in community service for the Junior League. A New Member who is unable to complete all New Member commitments during a twelve month period may resign in good standing and reinstate when she is able to complete the New Member Training. New Member dues of $175 will be collected with the completed application no later than May 4, 2018. This application fee will be reimbursed, unless applicant is accepted as a New Member to the Junior League of the Palm Beaches. New Member fee of $100 is due no later than September 1, 2018. This includes a JLPB t-shirt. Any New Member who does not submit the $100 New Member fee by September 1, 2018 will forfeit her place in the New Member class. Attendance is required at 5 New Member meetings and 3 General Membership meetings. Volunteer points- minimum 10 points between Deck the Palms Holiday Market, Kids in the Kitchen and other participation. Active annual dues of $175 will be due March 1, 2018 for the 2018-2019 League year. Upon completion of the New Member course in May, New Members will reach Active member status. Successfully complete the New Member training course. Satisfactorily attend and participate in assigned Committee placement. Earn at least 25 points on Junior League sponsored projects in addition to assigned committee placement’s requirements. Fulfill financial and volunteer commitments for the Deck the Palms Holiday Market. Pay active annual dues by March 1st for the following League year.